Get one of 3,000 Aveda three-piece hair Damage Remedy sample packs ($4.50 each). 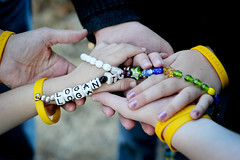 If you know a child who has had cancer in the past two years this is a great program for them and their siblings. FREE Kashi Product - 1st 1,000 on 4/30 @10:01am ET one of 1,000 coupons for a FREE Kashi product (up to $5 each). Dress like Big Boy and get FREE Frisch's May 3. You blog about what you know. I know about deals, how to live a better family life, childhood cancer, special needs education, child advocacy and now I will relearn about military deals. I am so proud of my husband he was recommissioned as an Offer in the Kentucky Army National Guard. Returning to service has been on his heart for a long time. Here is a great link to over 200 military discounts. 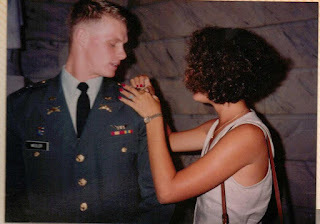 I was very young the first time my husband was in the military so I was not the SMASHing deal getting pro back then. If you have any tips for military savings please share them with me. This is a photo of us 18 years go when he was first Commissioned as an Office. FREE Starbucks Coffee or Tea on Earth Day (April 22nd) When You Bring Your Own Mug. On April 22nd, receive a FREE reusable shopping bag when you take 5 plastic shopping bags to a Disney Store to be recycled. While supplies last, limited quantities available. Go here and click on Upcoming Events, or see store for details. Until September 30th, 2012, purchase any 2 Kellogg’s Cereals or Pop-Tarts and submit the form found here to receive one of the Kellogg’s Reusable bags pictured above for $1.75 shipped. Get a FREE reusable bag near the Guest Service desk in stores. Limit one per guest, while supplies last. Teachers, head over to grab a Subway Kids Random Acts of Fitness kit. If you know a teacher, feel free to share this post! My friend from the kids school turned me on to http://www.dafont.com/ Dafont is a great place to get FREE fonts for your newsletter or craft project. Here is a way to find the deals you want. You get custom deals sent to you in a group to make it easy and so you never miss a deal. ChoozOn - Sign up for ChoozOn and have all your personalized daily deals sent to you. I have a friend who is getting ready to have her third baby and we were talking about baby coupons at Girl Scouts. So Dianna and all new moms this post with a lot of baby deals is for you. Sign up for a FREE SUBSCRIPTION to Baby Talk Magazine. Click photo for link. Last week I told you about all the great FREE samples you can get from P & G. Now you can also sign up to win great prizes. Make sure you sign up. P&G Everyday Solutions Sweepstakes - Enter for the chance to win a home theater package by Panasonic® - along with the weekly prize of a $50 Visa® pre-paid debit card. Arby's FREE Value Curly Fries from Arby's (with coupon) on Tax Day! Taxes can be taxing, so let Arby's put you in a good mood this Tax Season with FREE Value Curly Fries on Tax Day (4/17) and a chance to win a $5,000 Tax Relief! Be sure to visit the Arby's Facebook Page starting on April 13 to print your FREE Value Curly Fries coupon to use on Tax Day, April 17 and to enter the Arby's Tax Relief Sweepstakes! Saveology $5 For A $15 iTunes Gift Card - Pay $5 For A $15 iTunes Gift Card & 14 Day Trial Membership to Saveology Elite w/ Auto Renewal. Spotify is a new way to enjoy music. Simply download and install, before you know it you'll be singing along to the genre, artist or song of your choice. With Spotify you are never far away from the song you want. There are no restrictions in terms of what you can listen to or when. Forget about the hassle of waiting for files to download and fill up your hard drive before you get round to organizing them. Spotify is instant, fun and simple. Spotify - Search and listen to millions of songs using Spotify. Simply download and install for FREE. This is too Cool! birthdayFB is a neat little Facebook "helper" that automatically posts birthday wishes on the walls of your Facebook friends. There are quite a few apps of its ilk, but the best thing about birthdayFB is that it does not let your friends know that you are relying on a third-party tool to remember their birthdays. BirthdayFB.com is a Facebook APP that automatically posts birthday wishes on the walls of your Facebook friends. My family loves The Old Spaghetti Factory. We make a special trip to Cincinnati or Louisville for a fun night out. Sign your kids up for a FREE birthday meal. Smashing Tomato will give you a FREE pizza with a drink purchase Tuesday 2-4 pm. Go CATS! FREE Orange leaf and Coach Cal wants you to celebrate UK's win with Orange Leaf! We're giving away 5oz free to everyone all day long Tuesday.